Do you remember the excitement you felt as a kid when you helped set up seats in front of the local temple, brought along your own snacks, and leaned forward with anticipation waiting for the movie to start? As the audiovisual entertainment industry expanded, open-air cinema was gradually squeezed out by movie theaters and cable TV. 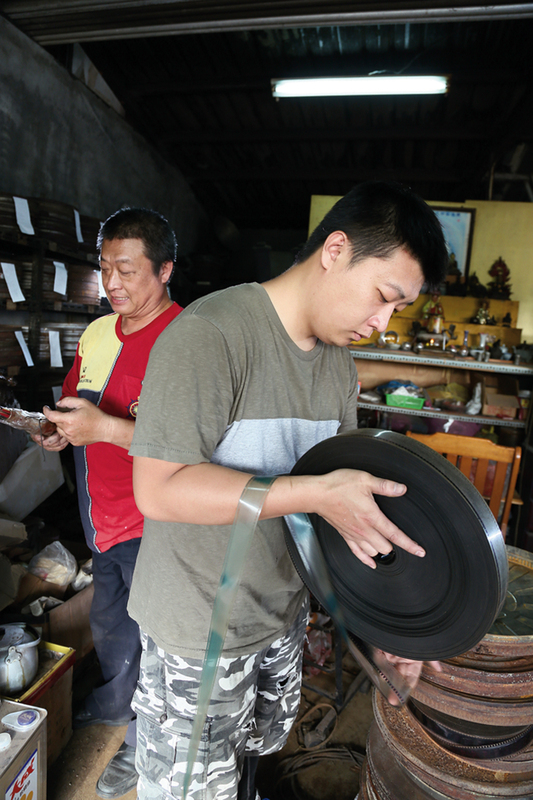 Although the golden days of outdoor movies are long gone, Gao Xiang­qing and his son Gao Pu­yuan have not forgotten the warm feeling of gathering together during screenings in their hometown of Tai­nan. To this day, they are preserving the traditions of open-air cinema and hoping to entice new generations to enjoy those magical memories from the 1970s. The film projector’s sprockets whirr as it projects a movie at 36 frames per second. The projectionist must pay constant attention to the projector’s every movement and to the film feeding through it. The perfect screening is arrived at only through a delicate dance between projector and projectionist. Projectionist Gao Xiang­qing, born in 1964, began to help his father, Gao Jing­shan, at the age of 13, and has since accumulated four decades of experience as a projectionist. For a time in the 1970s, Gao Jing­shan was the chief technician at Tai­nan’s Chung­hua Theater, where he acted as projectionist and maintained the theater’s equipment. After pornographic films were shown at the ­theater, however, Gao Jing­shan was detained by the police and spent two weeks in jail. The experience prompted him to seek greater freedom as a projectionist by turning to open-air cinema. 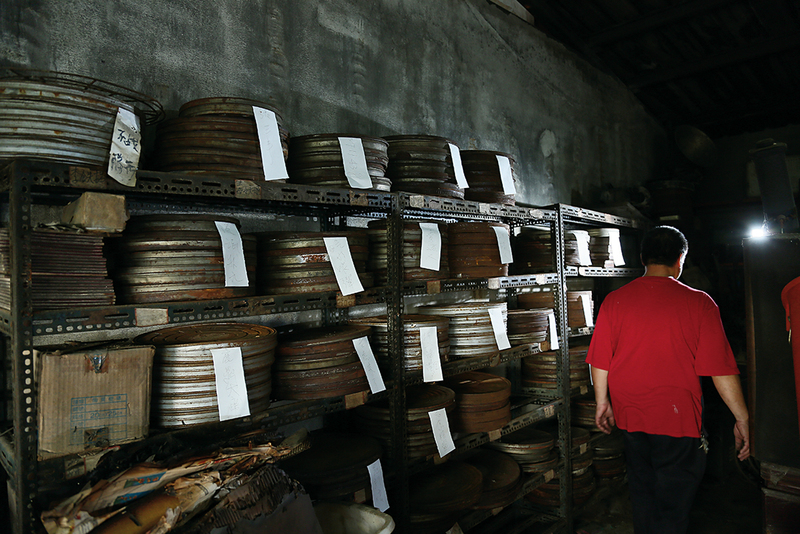 Gao Xiang­qing’s first step to becoming a projectionist was to study how his father rewound films after a showing. He watched intently as his father operated the rewinding machine, using his fingers as a buffer to control the rewinding speed and also to check the condition of the film. If he encountered damage or irregularities, he would stop and inspect it more closely before continuing with the process. While he checked the film with one hand, the other held a wooden guide that ensured rewinding at a uniform width. “When business was good, we had eight screenings a night, and to make sure that the film was ready, you can bet we had to rewind it quickly. If I did a bad job or worked too slowly, my dad would whack me with that wooden slat.” To this day Gao has not forgotten his father’s strictness. At 16, Gao completed his apprenticeship and became a projectionist in his own right. Temples both large and small are common in southern Taiwan, and they hold temple fairs throughout the year. In the 1980s there was a craze for lottery-style gambling. Some who made money would host films outside temples to thank the gods for their luck, and at some temples a couple of movies would be showing at the same time. All by himself, Gao could manage two showings at once, and sometimes even operated four projectors without a hitch. 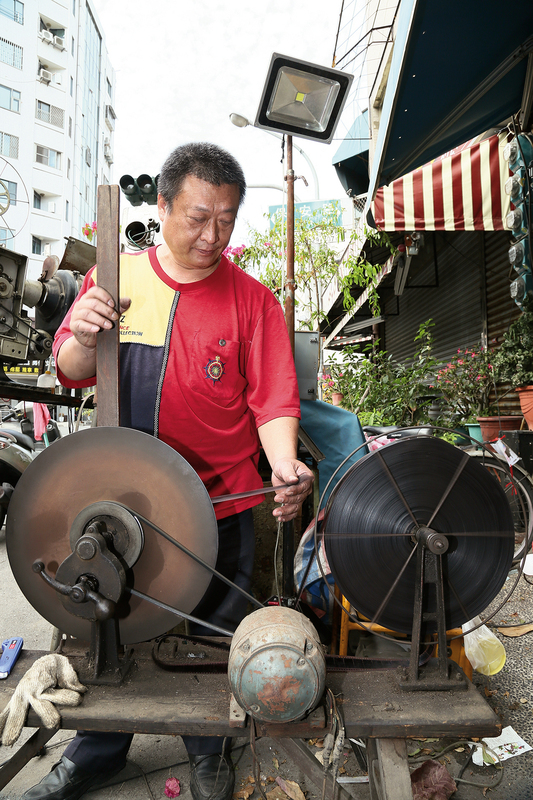 Just as his father had relied on film projection to support the family, Gao also recruited his wife and children into the projection business to help the family make a living. 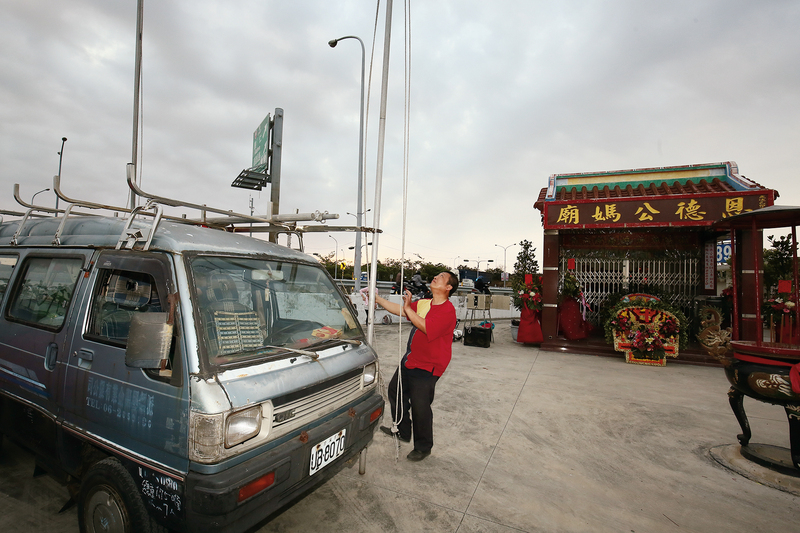 Today his son Gao Pu­yuan, born in 1990, has returned to Tai­nan to take up the projectionist’s craft. Pu­yuan also started to learn from his father at an early age. By second grade, he could already manage open-air films shown with a semiautomatic projector. After majoring in film and video studies in college, Gao Pu­yuan moved to Tai­pei, where he threw himself into various film and television projects. Unwilling to let the projectionist skills cultivated in the family be forgotten, Gao moved back to Tai­nan with his wife, who also worked in film production. Together they founded the Bear Men Film Studio in the hopes of resuscitating the dying art of open-air cinema. In the past, open-air cinema was a popular entertainment at a time when people had little money and few options for amusement. On movie nights, temple courtyards filled up by 4 p.m. with residents awaiting the show. Sellers of marinated fruits and roasted eggs hawked their wares, and the atmosphere was as lively as a night market. In the ’90s cable TV arrived in Taiwan, and open-air cinema began to decline. And as digital filmmaking techniques replaced film, open-air cinema became almost a thing of the past. Outdoor screenings using traditional film nearly vanished altogether. 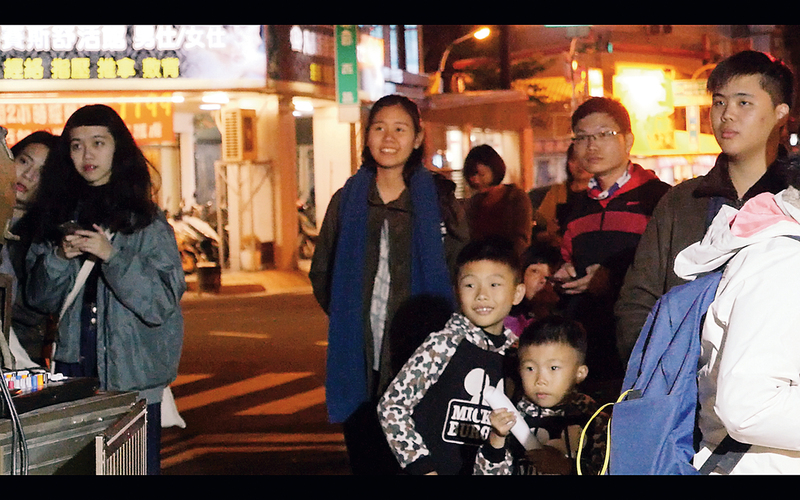 Today open-air screenings can be found only during temple fairs in central and southern Taiwan. Each traditional film screening required two projectors, some 20 or 30 kilograms in weight, and tested the skill and physical strength of the projectionist. During the decline of open-air projection, old-fashioned film projectors were increasingly replaced by digital projectors, which take less skill to operate and are lighter and cheaper. The film projector that currently sits in the Bear Men Film Studio was purchased from abroad by the Gao family in 1980. The projection mechanism and lens alone cost more than NT$200,000. 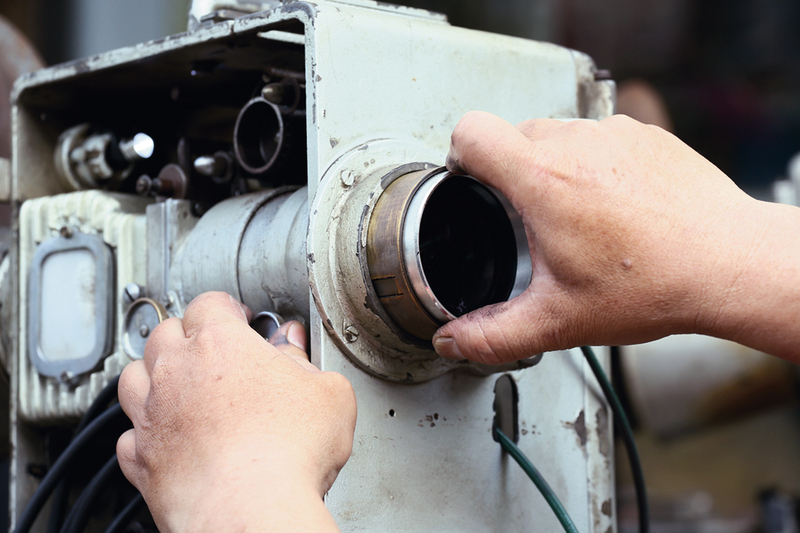 Under the loving care of Gao Xiang­qing, this projector manufactured by Japanese and West German technicians is still in service today. After the Gao family purchased projectors originally intended for use in movie houses, they asked a craftsman to make a casting mold from the casing of the projector and reproduce it in cast iron. The light source was changed to a carbon arc lamp in conjunction with a mercury reflector. The result was a projector suitable for open-air film projection. Because a movie shot on traditional film requires on average 4.5 cans of film, screening them requires two projectors. When one reel spins out, the projectionist must immediately switch to another projector to show the next part of the film. Many people are under the impression that a projectionist’s job is pretty easy—just load the film and press a button. But a projectionist must constantly monitor the image appearing on the screen and keep an eye on the functioning of the projector. A carbon arc light projector, for example, uses two carbon rods, one positive and one negative. Up to a kilowatt of electricity courses between them to produce the lamp’s powerful light. As the movie is projected, the rods burn down, and the projectionist must constantly monitor the distance between them. If they are allowed to get out of adjustment, the light can suddenly fade and the film projection will be interrupted. The films for open-air projections originate with film distribution companies. A three-day rental can cost as much as NT$100,000. 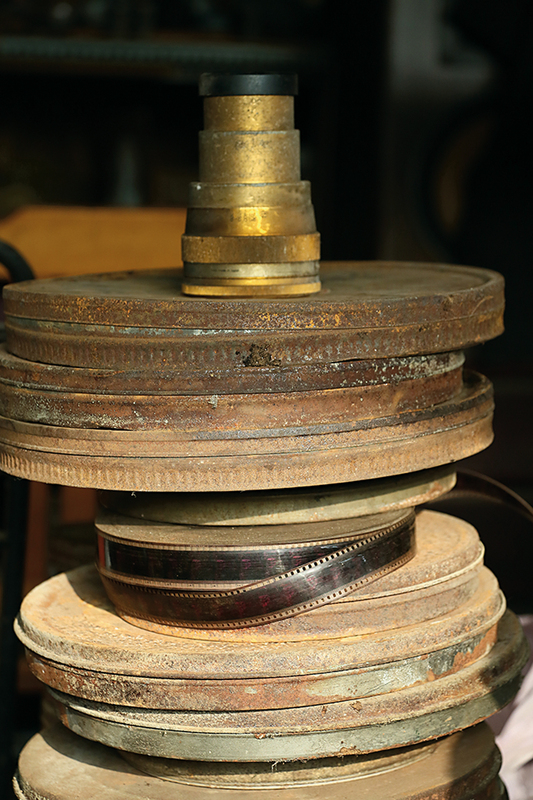 In general, costs are shared among projectionists who then circulate the film between them. As open-air projections switched over from celluloid to digital, the price dropped from NT$30,000‡40,000 per showing to NT$2,500. Celluloid films are increasingly hard to find. Gao Xiang­qing opted to build a treasured collection that he purchased himself. Both heat and water are destructive to film. The first five minutes of using a projector can be especially precarious. Outdoor projectionists will therefore splice on five or ten minutes of “snipes” (lead-in film), with content of their own choosing, at the beginning of a movie. 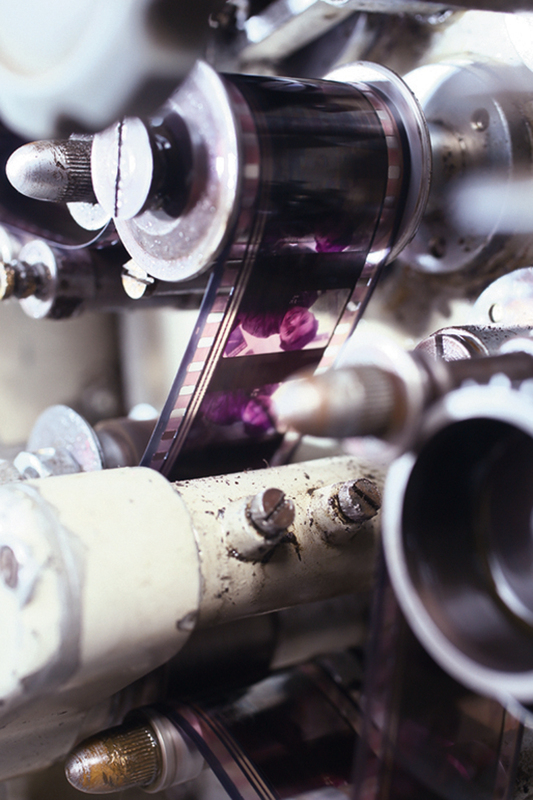 Aside from the beginning of the film, projectionists also add “cue marks” to the final frames of a reel of film. They then monitor the screen, and when they see the marks appear, it acts as a signal for them to switch projectors. In recent years, film projectors have all but disappeared as people showing films at temple fairs have switched to digital projectors for their outdoor screenings. 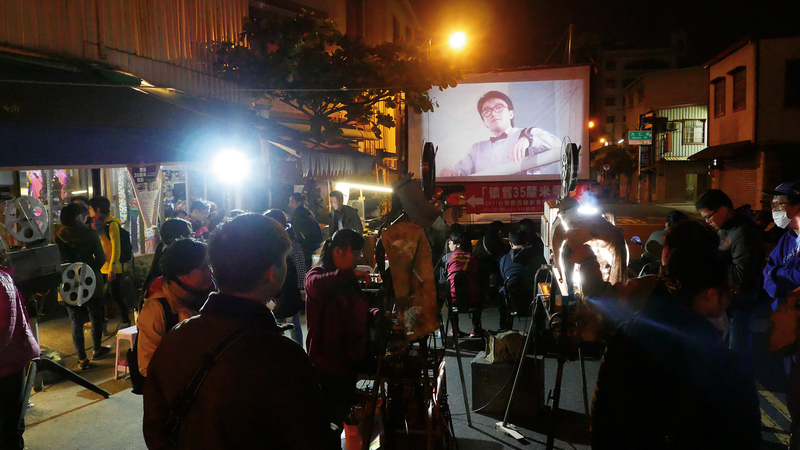 When Gao Pu­yuan returned to Tai­nan, the first thing he wanted to do was to hold a screening using traditional film projectors. But they are not easy to maintain since parts are in short supply. Moreover last year flooding caused by a typhoon, and then a fire, damaged the warehouse used to store their films, ruining over a hundred films. Despite the difficulties, Gao refused to give up. After a year’s preparations, a three-day open-air film festival was held in January. As entertainment for common folk, open-air cinema often relies on light, escapist fare, such as kung-fu and science-fiction films. For his film festival, Gao Pu­yuan selected The Kung Fu Scholar (1993), The 18 Bronzemen (1975), and Gamera: Guardian of the Universe (1995), among other films. Gao Xiang­qing had assumed that interest in watching movies rolling on the reels of old projectors had already vanished. 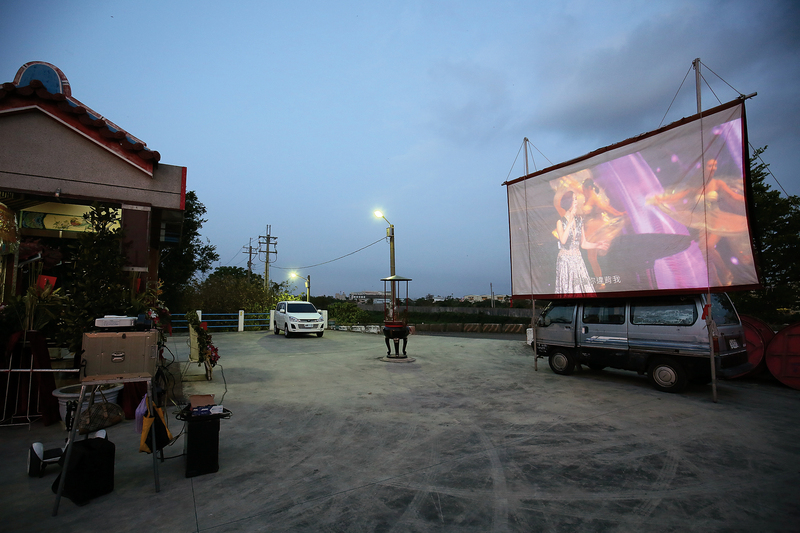 But Pu­yuan won him over to the idea of bringing open-air cinema back to the public. He never imagined that in the end they would draw throngs of people and project films to overflowing audiences. Gao Pu­yuan has since proposed an ambitious plan to the Ministry of Culture to gain support for an open-air film festival that would tour Taiwan. As part of the plan, he would like to invite film industry professionals from home and abroad and solicit films for screening. In this age of digital production, he would also like to fulfill his dream of converting digital productions to film. Because of open-air cinema’s gradual decline, Gao Xiang­qing for a time tried his hand at another profession. But for Gao Pu­yuan, seeing his father’s confident smile while he works the projector is unforgettable. 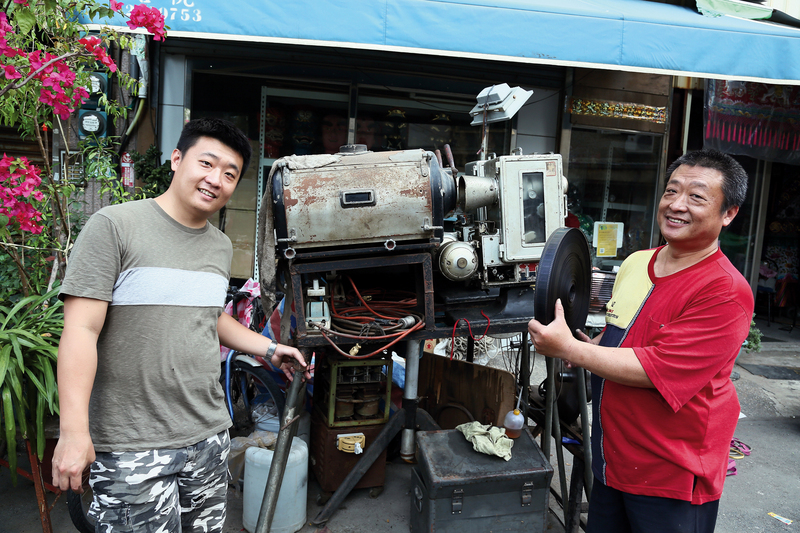 Even when people poked fun at their plans, father and son have persevered in reviving interest in movies shot on film and rekindling amid the whirring of the film projector the human warmth of open-air cinema.